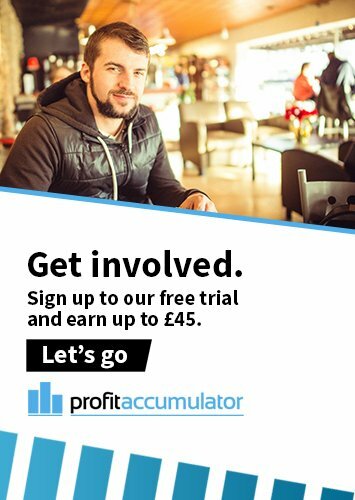 Profit Accumulator is home to the biggest and most active matched betting forum on the web. More than 10,000 members regularly use the forum and, to date, more than 1.1 million posts have been published. 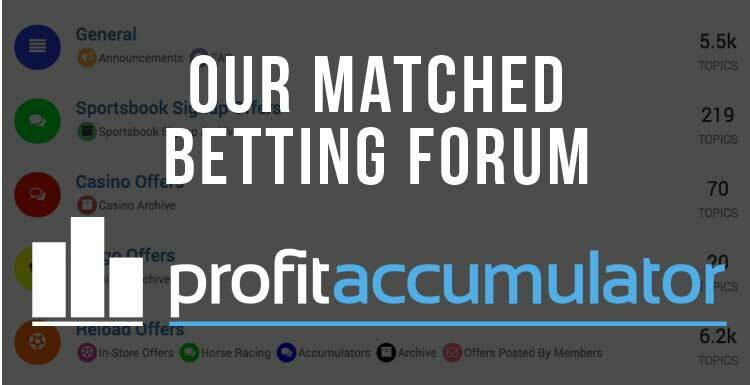 Profit Accumulator's matched betting forum is moderated by a team of highly experienced matched bettors, who are available to answer queries, offer support and share their own tips on how to be a successful matched bettor. For many PA subscribers, the forum is one of the key benefits of being a member. In a series of Q+A articles with members, the matched betting forum was often cited as users' favourite element of the PA service. Clarke said: "My favourite thing by far is the forum. "Having a community of like-minded matched bettors is extremely helpful - 99% of the time any queries you have can be answered by the forum. "It is also the source of a lot of information on reload offers - a massive part of matched betting to keep you earning consistently. PA member David said: "The website and forum are very good. I like the fact that there is a community. "It's not a case of just being left to it." The forum is open to Platinum members Profit Accumulator. Bookie offers can be found on the offers section of Profit Accumulator but the forum is also a great place to find bonuses. Often, bookmakers offer short-term promotions and incentives and users share these on the forum. Users and administrators also explain how to take advantage of these offers and how profits can be maximised. Members are also encouraged to post their own offers on the matched betting forum, particularly if they have received offer invitations via email or text. Of course, the forum is a fantastic source of help and support for users of all experience - from beginners to those who have been matched betting for years. There is a friendly, community feel and everyone is welcome to post questions to help with their matched betting journey. Members also use the forum to share resources and tools, such as spreadsheets and documents to assist with keeping track of profits across accounts. As well as the serious stuff, the forum is a place to share stories of winnings and chat with fellow matched bettors. There are dedicated threads to post big wins, such as on casino slots and sections for members who have joined the £1k Club and the £3k Club. Users of the PA matched betting forum are asked to the following rules. Post your questions in the correct thread. Each thread is linked directly in the related offer on the Profit Accumulator website. You can usually click the forum link in that offer to go straight to the discussion of that offer. Research before you ask questions. A brief read of the comments and a proper read of the instructions will save you time and trouble, and will keep the forum tidy. You'll find people are much more willing to help you if you take the time to research first. Share offers and loopholes that are worth doing. Once in a while we'll miss an offer. Share it here. Read the post on "understanding value" if you're not sure if an offer is worth it. This is a great place for us to work together to make some money. Ask questions in the replies for each thread and help each other out as much as possible. Help other people as much as you can. Stay positive and post screenshots of your best wins to motivate others. Don't mention any other products (paid or free). Don't post affiliate links (even in private), and don't spam. Don't send unsolicited messages to other people in the group (even in private). No asking people to message you for more info in an attempt to circumvent forum rules. No discussion of gnoming or multiple accounts. Don't share your Profit Accumulator account or forum access with other people. This is for your personal use. If you share it with friends or family you'll find your account gets deleted. Don't be rude to anyone, ever - even if they were rude first. Ignore them and report them. No asking why your post was removed, or any other queries or comments about our moderation. If your post gets removed and you don't know why, contact an admin for an explanation. Keep the forum positive and on-topic. This is for the discussion of Matched Betting and offers on PA. If you have constructive feedback for us or complaints, they should be sent to [email protected]. Complaints and moaning are not allowed on the forum - we don't want a minority ruining the forum for everyone else. If you don't have anything nice to say, don't speak. Give everyone the benefit of the doubt. No accusing anyone of lying or boasting. Don't post personally identifiable information. This includes, but is not necessarily limited to, offer screenshots including personal information such as full names, addresses etc. Where possible, please edit this information out. Please avoid posting anything that relates to illegal activities, including piracy and copyright violations.